Midgard’s Western Wastes are a wound that will never heal, festering in the wake of the Great Mage Wars. Fine dust chokes the blasted landscape, swirling across dunes, craters, and ruins held in the grip of deadly unpredictable magic. Empires lay buried in the wasteland’s dust, and beneath even those remains, echoes of lost Ankeshel rest in the cold dark. In the shadows of the Dread Walkers and their spawn, few creatures could survive, let alone thrive. And yet, even in the wastes, life endures and flourishes. Pilgrims and priests travel to the Seat of Mavros. Scholars and explorers brave the ruins in search of power and knowledge, and the dust goblins slowly grow into a formidable power. Groups of dust goblin shamans, druids, ruin hunters, and explorers once banded together, united by their lives spent crawling the Western Wastes. These canny survivors eked out a living among the dust and unpredictable magic as they searched out lost relics from empires long buried. The Circle of Dust is the result of their study. Today, most of the Circle of Dust are dust goblins, but druids of other races brave or foolish enough to venture into the wastes to earn the circle’s trust have joined their ranks. Druids of the Circle of Dust align their magic with the unpredictable mystic nature of the wastes. They draw sustenance from it, protect against otherworldly creatures, and gather lost knowledge hidden beneath the ancient sands. The shattered magic of the wastes infusing your being grants you knowledge of certain spells. At 3rd, 5th, 7th, and 9th level you gain access to the spells listed for that level in the Circle of Dust Spells table. Once you gain access to one of these spells, you always have it prepared, and it doesn’t count against the number of spells you can prepare each day. If you gain access to a spell that doesn’t appear on the druid spell list, the spell is nonetheless a druid spell for you. At 2nd level, you gain proficiency with Ankeshelian medium armor, relics, shields, and weapons. You can wear and use Ankeshelian armor and shields made of metal. Your melee weapon attacks deal an extra 1d6 force damage to any target they hit. Your AC increases by 2. When you cast spells with a range of touch, your reach extends to anywhere within your shroud. Other aspects of the spells are unchanged. When you, or an ally within your shroud, cast spells in the Western Wastes, you don’t risk unstable results from your spells (see Midgard Worldbook). The aura lasts for 1 hour or until you use your Wild Shape again. At 6th level, your mind transforms due to the twisting energies of the wastes. While your Resonating Shroud is active, you can no longer be charmed or frightened, and aberrations must succeed on a Wisdom saving throw against your spell save DC to attack you. An aberration that fails this save can choose a new target, or it wastes the attack. 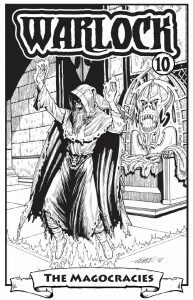 At 10th level, you have advantage on saving throws against spells and other magical effects. Additionally, when you take damage from a spell, you can use your reaction to absorb some of the energy. You can expend Hit Dice to regain hit points as if you finished a short rest. The maximum number of hit dice you can expend is equal to half your druid level. Once you use this feature, you can’t use it again until you finish a short or long rest. At 14th level, your Resonating Shroud now extends to the area within 30 feet of you, and your foes treat the area within your shroud as difficult terrain. A creature hostile to you that ends its turn in your shroud takes 1d8 force damage. Read more of this and other great articles in Warlock, only on Patreon!